Season 7 has been bumpy for Game of Thrones viewers, as two of the year’s most climactic episodes accidentally leaked ahead of schedule, while script summaries of others have proven largely accurate. It’s damaging to the weekly sense of water-cooler excitement when landmark events like “The Spoils of War” battle are available days before their intended debut, but doubly-so when hours tonight’s penultimate “Beyond the Wall” suffer some of the worst, most poorly-constructed Game of Thrones plotting in some time. Don’t get me wrong; I love ice zombie battles, unexpected character interactions and all the implications a wight dragon might bring, but – for a 71-minute episode – it’s clear as a bell that “Beyond The Wall” had almost no major story to tell. Over and over, we’d cut back to Jon and his motley crew marching in a line; highlight some unusual pairing of two characters, cut to Arya and Sansa or Tyrion and Daenerys for a few minutes, and then repeat the process. It all builds to a dynamic climax of the group in need of rescue from wights on all sides, but the mind-boggling logistics of Gendry running to The Wall, sending a raven to Dragonstone, and Dany flying* up to intervene are as rushed and compromised of a Deus ex Machina as Game of Thrones has ever had. If there wasn’t time to script a rescue that made sense in the context of the story, writers should never have sent the group north in the first place. *The idea of a wight or ice dragon has persisted in one form or another for years, and presumably serves to allow The Night King past The Wall. 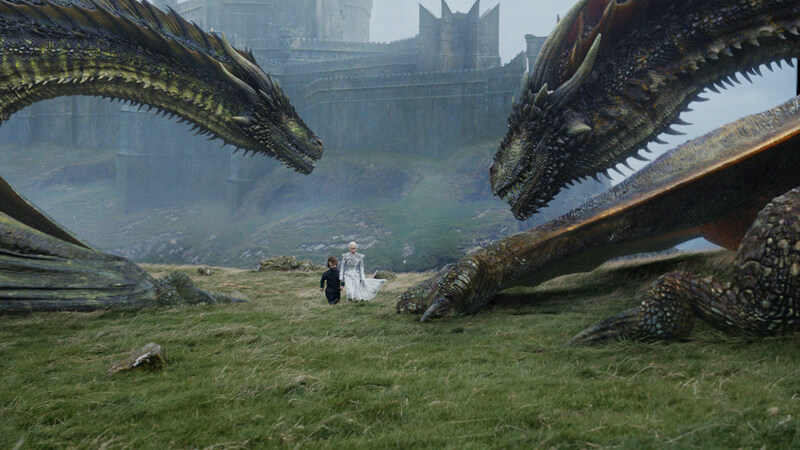 Still, Game of Thrones has never known what to do with the other two dragons, and if ever showrunners David Benioff and Dan Weiss were guilty of turning these last seasons into fan-fiction, this would be it. Whereas this would be fan-fiction of my wedding. Spending time with such unusual combinations as Tormund and The Hound or Jon and Jorah could have been a fun, Band of Brothers way to spend the hour, but stories south of the wall suffered a lack of urgency as well. The Dragonstone side at least saw Tyrion voicing his concerns of Daenerys’ aggression and successor, but the Arya-Sansa conflict at Winterfell had no such questions to ponder. Not only does it feel wildly out of character for Arya to torment and threaten Sansa after equally traumatic years apart, but the threat feels completely intangible to the story. What’s the angle? Arya outs Sansa* as a weak leader and the northern houses disband? Granted, The Vale and every other lord have idly hung around Winterfell all season, but why retread the same ground as Robb struggling to keep his army together in Season 3? 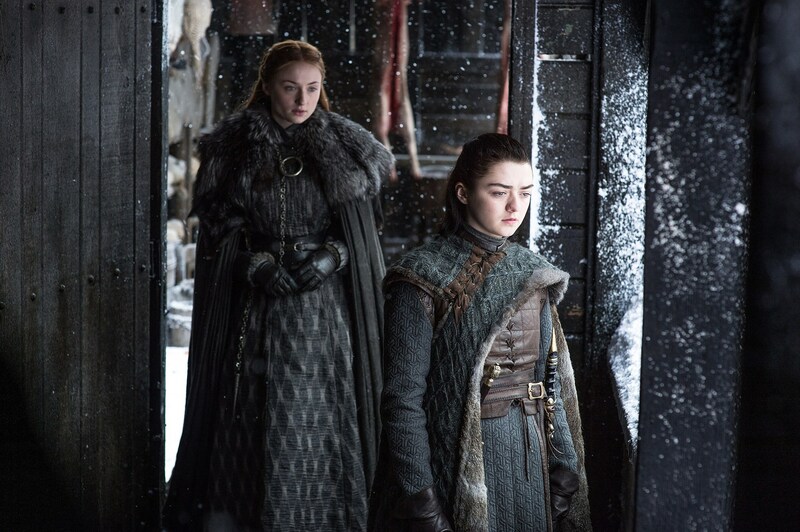 *The best possible answer here is that Arya and Sansa have made a show of fighting around Winterfell to entrap Littlefinger in some treachery, but it’s painfully clear writers weren’t sure what to do with Maisie Williams and Sophie Turner this year. Ice dragon or no, “Beyond The Wall” needed consequence. Capturing a wight in the snowy wasteland is too A to B to carry a full episode, and it’s ludicrous such a deadly conflict would cost only unnamed extras and the group’s least-developed character. Thoros didn’t even get to die heroically; instead being injured by a wight bear that had nothing to do with their mission, and dying offscreen later. We lost Benjen as well, but his last-minute appearance was so random and underdeveloped that Jon barely even has time to process his uncle’s return before seeing him torn to shreds. Not every lingering plot point merits revisiting, guys! Hot Pie and Gendry would have been fine on their own. I’ll admit, there’s a certain poetry to Jon’s mission to prove the White Walker threat handing The Night King exactly what he needs to invade. It’s a chilling moment to propel us into next week’s finale, and hopefully one not undercut by another leak. Season 7’s pacing and structure is hard enough to get a grip on, without “Beyond The Wall” desperately stretching two or three big moments into 71 minutes. So now Tormund thinks Mance was wrong for refusing to kneel? And why yet another repetition of the “died for [his] pride” line? Oh hey, Beric doesn’t think Jon looks like Ned Stark. Watch for falling anvils, everyone. We’ve been hearing about ice spiders for six seasons, and they go with a bear? Don’t strain yourself trying to mesh the timelines/geography. At best, maybe Jon and co. were trapped on their little island for a few days, but it’s not going to match cleanly, if at all. Way to roast The Night King and his lieutenants to end the entire war, Dany. For the record, the ice dragon will still breathe normal fire, right? It’s the same dragon, just reanimated under The Night King’s thrall. And where did those chains come from? Game of Thrones Season 7 will conclude next Sunday, airing at 9:00 P.M. on HBO.